Are you tired of waxy, boring chocolate. YOU deserve the very best! Chuao is giving America a chocolate makeover with their handcrafted, all-natural gourmet goodies, now available in select Target stores and specialty retailers nationwide. 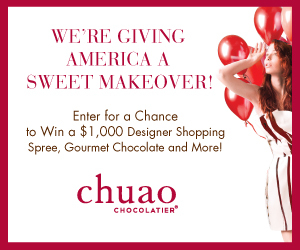 To celebrate, they are launching a Sweet Makeover sweepstakes and offering you the chance to win a $1,000 designer shopping spree on Shopbop.com, along with many other crave-worthy prizes! So, go to the Chuao Facebook page, and enter to win! !